Sidhshakti Angel Healing is a very easy, powerful yet quick way of Universal energy based Healing created by Sri Maa. By learning this healing directly from Sri Maa, all children can receive the power to heal themselves from any problem anytime, anywhere. They can also easily prevent problems to stay strong & healthy. This healing is taught to them in a very gentle way through stories and games, which brings them immense joy and thus they become self motivated to practice it daily. There are 5 levels of Sidhshakti Angel Healing which children can learn & practice. Shakti Mantra is a special Universal energy based Mantra granted individually by Sri Maa to children to ensure their over-all growth and development. This mantra also balances and energizes them at all levels including their brain-body-mind & soul. Many children who have empowered with this mantra in their childhood have excelled greatly in their lives. This mantra is also a pre-requisite of starting Sidhshakti Kundalini Awakening Meditation. Kundalini is the ancient name given to the ‘Energy of the Whole Universe’ situated within every living being. When it is awakened (only under the presence of an experienced teacher- Sri Maa) it can bring about the most exceptional purity, balancing, growth and development in every sphere of life. SRI MAA guides us that- “children of today have a lot of energy and their energy must be guided in the right direction.” Thus regularly practicing Sidhshakti Kundalini Awakening Meditation would make this power useful for their own well-being, studies, career, relationships, along with complete development of their family, country and society. In earlier times Kundalini awakening was taught in Schools, Gurukulas and all ancient systems of education. As Sri Maa says, “Children are the future of our homes and country.” Thus in the modern generation it is essential that parents and teachers take up this responsibility sincerely to bring about complete overall growth & development to the children of our country and the world. Through Sidhshakti Kundalini Awakening Meditation- Sri Maa has made the process of Kundalini awakening very simple. Thus even little children can do it and progress in their lives right from childhood- to become balanced, healthy, powerful and successful human beings. I want to share the experience of my 4 years old son Aadish after he learnt Kids Healing Level 1 from Sri Maa. During the Kids Healing Level 1 meditation, Aadish saw a beautiful fairy named Blossom in fairyland. He said that Blossom was wearing the same dress as Sri Maa was wearing that day during the meditation. Blossom also came and asked Aadish what his name was. The day before Aadish learnt Healing from Sri Maa, Aadish had banged his head on a drawer and there was swelling and pain at that place. When Maa asked how he felt after the Healing, Aadish told Maa about this hurt and that all his pain at that place was gone. I pressed the part where the swelling was there and still he didn’t have any pain there. It was amazing to see how such a young child could heal himself in a matter of few minutes with so much ease.I am so grateful to Sri Maa for making the Healing process so simple for kids that they can do it in very less time and understand it very simply. Maa, I want to share the experience of my 8 years old daughter ‘Akshadha’ after she received the initiation of “Kids Healing Level 1”. During the Healing Level 1 meditation Akshadha saw a beautiful fairy named Blossom in fairyland. Blossom was wearing a beautiful long dress made of blue and purple flower petals weaved together. She also saw some toadstools on which the fairies sit in the fairyland. Akshadha was so enticed by Blossom and her dress that she sat and weaved some flower petals together to show us how Blossom’s dress was. Akshadha had some cold, which had been prolonging for many days. She was able to feel clear of that immediately after learning and doing the Healing with Sri Maa. She has been feeling so empowered after learning Healing from Sri Maa that most of her fears have vanished. She is able to heal most of her small ailments on her own and she tells me only after she has done that. The very next day after learning Healing Level 1, she was playing with her friends in the park. A boy had cycled on her toe by mistake and she instantly healed it on the spot and told me when she came back home later that all the pain from her toe vanished completely after she had done the Healing. She did not even need to come to me for any kind of support or help. She never misses her Shakti Mantra or Healing any day since she is waiting to learn Level 2 from Sri Maa when she comes in December so that she can also heal her friends. I thank you Maa from the depths of my heart for making these so simple for children and making them feel so empowered. It is so relieving for us mothers to see these wonderful changes in our children. Koti Koti Dhanyawaad Maa. Aashita Chadha – 34 years. I took Shakti Mantra for my 6 years old son from Sri Maa a couple of months back. I was so happy that he really liked that he has a secret powers which can help him any time. Children like stories of fairies, magic, superpowers etc so it was quickly accepted. Now I just remind him and he recites it on his own. Recently he got a blister on his hand for which I did healing and he did Shakti Mantra regularly and together we healed it without any medical intervention. It gives me immense pleasure that instead of running to a doctor or remembering names of medicines my son knows a natural way to heal and protect himself. Children are always eager to learn all they need is right atmosphere, guidance, and motivation to take their first step and grow further. Thank you so much Sri Maa for making such powerful and unique gifts for everyone including children and making our like easy. 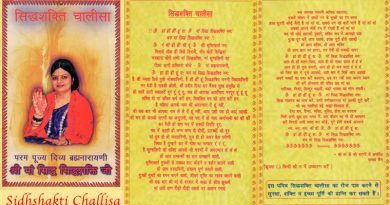 Jai jai Maa Sidh SidhShakti Ji….Charan Sparsh…. My Son (6 years old) took Shakti Mantra from you last Sunday. Though he still opens his eyes when he do it but he still does it. He felt very happy that you blessed Him. My father yesterday commented that he has started becoming calmer as a person. My experience has been is that I feel that when it comes to studying with me, he has started sitting with me for his studies more patiently and is slowly developing his will to study. He is still very naughty, but when he does his Shakti Mantra with me I can sense his calm nature at that time. His teachers have also seen a change in his behavior. I know and I have this belief that if he does his Shakti Mantra every day he will be a more Spiritually evolved soul and I am saying this with utmost surety because I am blessed to have Sri Maa’s blessings. 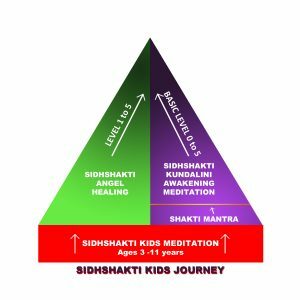 Child receives age appropriate overall growth, development and unending grace by doing Sidhshakti Kundalini Awakening mediation regularly. On 17th July 2016 we got to know that children above the age of 5 years can start Sidhshakti Kundalini Awakening Meditation. Under the supreme guidance of Sri Maa, our son Manikya who was 7 and half years old that time started doing the meditation in a proper way as he was guided (With Sidhshakti Kundalini Kit etc.). He also started doing Shakti Mantra. Sri Maa has made Kundalini Awakening Meditation so easy that even children can do it since young age. As children are very innocent and pure, they progress very quickly. By doing Sidhshakti Kundalini Awakening Meditation- along with the age appropriate development of the physical body, personality, brain development, their chakras and nadis also develop the as they actually should at the right age. As the chakras develop, so do the organs in the body develop in their right shape, size and proportion. All the weaknesses which were being carried forward by the child’s soul from the past get removed step by step. Their life becomes a blessing to themselves and to all others around him/her. Manikya has received such un-ending grace since that day which really cannot be described in words. I am really grateful that he has received this and much more. Since he willingly started Sidhshakti Kundalini Awakening Meditation just by closing his eyes and listening to Sri Maa’s voice through the Meditation CD once a day for few minutes he has had, many more experiences in day to day life. 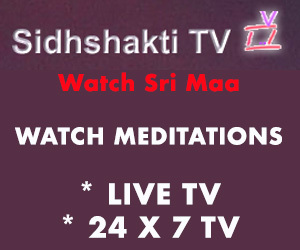 We are really grateful to Sri Maa for this gift- this most beneficial discovery of Sidhshakti Kundalini Awakening Meditation, which will bring true peace, balance and well being to the whole world.